The actual Green New Deal isn’t really that different from the flubbed FAQ page that was taken offline. The legislative text makes similar points the FAQ did, without using the FAQ’s language. 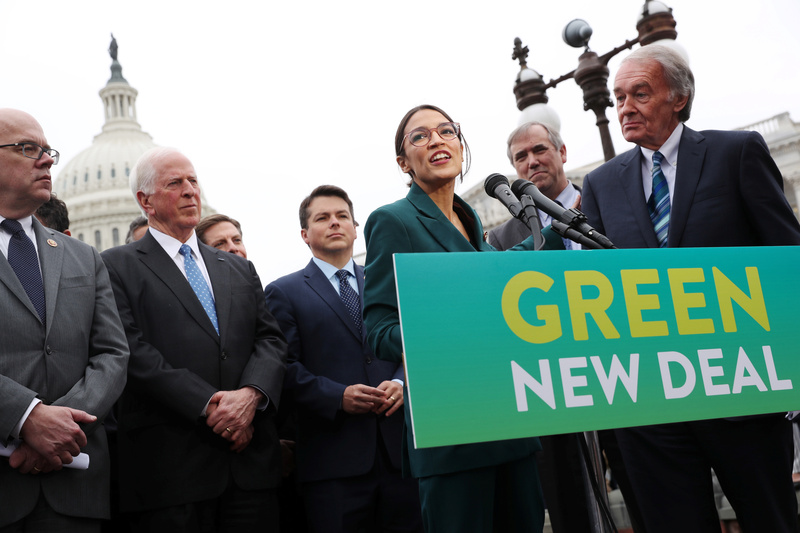 Ever since Democratic New York Rep. Alexandria Ocasio-Cortez released the Green New Deal, there’s been a swirl of reporting about what’s actually in the legislation versus the radical plans laid out in a FAQ document circulated with the bill. Ocasio-Cortez said to ignore the flubbed FAQ summary of the bill and focus on what the actual legislation says. So, is Green New Deal legislation really that different from the FAQ that Ocasio-Cortez’s staff eventually took offline? A close look at the Green New Deal’s legislative text suggests it’s not much different from the controversial FAQ circulated, then taken offline, by Ocasio-Crotez’s office. Elsewhere, the Green New Deal bill calls for the government to “ensure prosperity and economic security for all people of the United States” and also to provide “resources, training, and high-quality education, including higher education” all people in the U.S.
Ocasio-Cortez’s flubbed FAQ also referred to getting rid of “farty cows” and airplanes. The phrase “farty cows” doesn’t appear in the resolution’s text, but emissions from ranching is mentioned. “Working collaboratively with farmers and ranchers in the United States to eliminate pollution and greenhouse gas emissions from the agricultural sector as much as is technologically feasible,” reads the resolution. Any attempt to reduce greenhouse gas emissions from agriculture would necessitate dealing with methane from cow flatulence and burps. That means finding a way to make cows emit less, or, alternatively, getting rid of cattle altogether. The Green New Deal’s FAQ calls for building “out high-speed rail at a scale where air travel stops becoming necessary,” but the legislative text doesn’t use that language. Instead, the resolution calls for the government to overhaul “transportation systems in the United States to eliminate pollution and greenhouse gas emissions,” including high-speed rail. Ocasio-Cortez’s initial FAQ document included a call to phase out nuclear power, which is about 20 percent of U.S. electricity generation. The anti-nuclear language was taken off the FAQ posted to Ocasio-Cortez’s website. It’s true that the Green New Deal’s legislative text calls doesn’t explicitly call for phasing out nuclear power, but the resolution does call for promoting renewables — i.e. solar and wind. 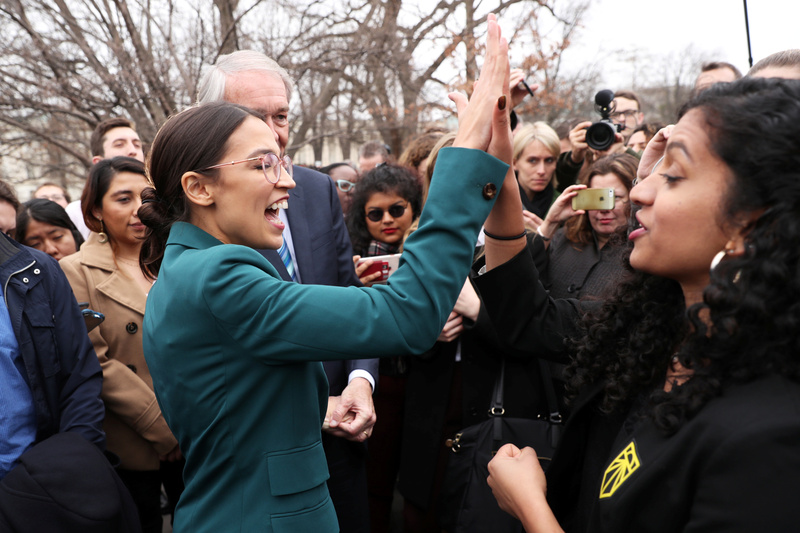 U.S. Representative Alexandria Ocasio-Cortez (D-NY) and Senator Ed Markey (D-MA) (obscured) celebrate with activists after a news conference for their proposed “Green New Deal” to achieve net-zero greenhouse gas emissions in 10 years, at the U.S. Capitol in Washington, U.S. February 7, 2019. REUTERS/Jonathan Ernst. Like in the FAQ, the resolution mentions “upgrading all existing buildings in the United States” and ensure jobs are “high-quality union jobs that pay prevailing wages, hires local workers” and “guarantees wage and benefit parity for workers affected by the transition” from fossil fuels. The resolution also calls for “stopping current, preventing future, and repairing historic oppression” of so-called “frontline and vulnerable communities.” That’s the exact language used in the FAQ.